This division has proven helpful in taking all demands and requirements of the different phases of a dialogue process into account and preparing them adequately. The guiding principles of the model are based on the Dialogic Practices of voice, listen, respect, and suspend. 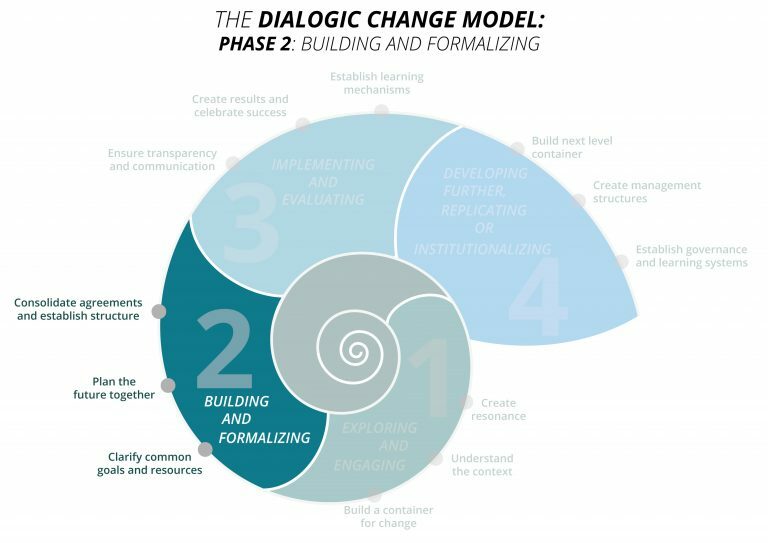 By using structured dialogue to create a space for collective intelligence, the model facilitates a process design that can be owned by all stakeholders. While supporting the 4C project, a cross-sector partnership between coffee traders, producer organizations, and international civil society organizations, the Collective Leadership Institute’s founder and Executive Director Dr. Petra Künkel, identified the factors that make a cooperation project successful. She noticed that the focus of project management is top-heavy on structure and noted the importance of the quality of dialogue between project stakeholders. Over many years, she documented her observations and developed a model that balances the ancient human knowledge of dialogue and collective intelligence with result-oriented process design and communication architecture. 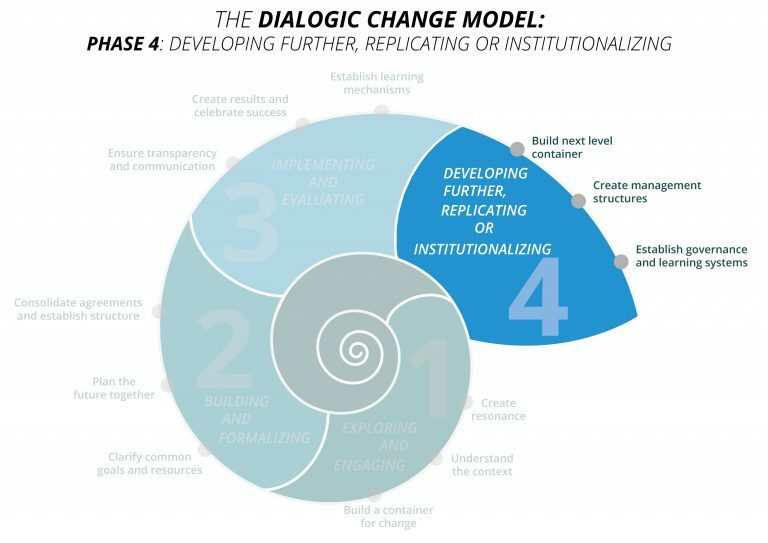 This is how the Dialogic Change Model was born. Phase 1 is focused on raising the energy for change and dialogue. In this phase, stakeholders explore the Stakeholder Dialogue’s context, taking other existing initiatives and the people involved into account. This requires understanding the external context, the factors that will influence the dialogue, and the dynamics of the complex system in which the Stakeholder Dialogue will take place. Talking to selected but relevant stakeholders and opinion-leaders informally in this phase can help clarify and elucidate the prospects and potential obstacles for dialogue and change. A small cross-sector team of engaged people, called the Container, can meet at various opportunities, exchange ideas, and receive inputs from interested and knowledgeable people in this phase. Phase 2 is geared towards consolidating the system of stakeholder collaboration and formalizing stakeholders’ commitment to change. Initial structures are developed, project teams defined, and regular meetings planned. This usually leads to agreements – the signing of a contract, a Memorandum of Understanding (MoU), a project plan, or a public address in the interest of the change endeavor. With an official event, and an agreed–upon, written document, the Stakeholder Dialogue officially comes to life. The structure for the Stakeholder Dialogue needs to offer a sufficient degree of ‘process safety’ in an otherwise unpredictable and complex environment; contribution, roles, and allocation of work as well as communication and process designs need to be agreed upon jointly. It is crucial to strengthen the work of stakeholders in the initial Container (the core group of initiators holding the intention for change). Commitment needs to be built beyond the initiators and complemented by a more formalized structure for implementation. In this way, the capacity of the initiative’s participants to learn and communicate is enhanced, and thus is the ability to solve difficulties. Depending on the form and purpose of the Stakeholder Dialogue, anything that shows commitment and gives structure to move forwards, e.g. 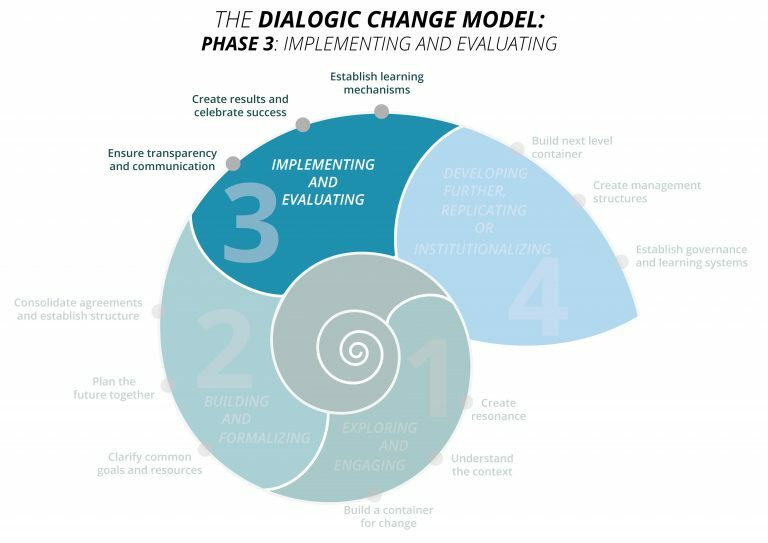 Phase 3 can be seen as the actual implementation of planned activities, including the establishment of an internal Stakeholder Dialogue monitoring system to ensure results and learning. Here, result orientation is a key factor for success. 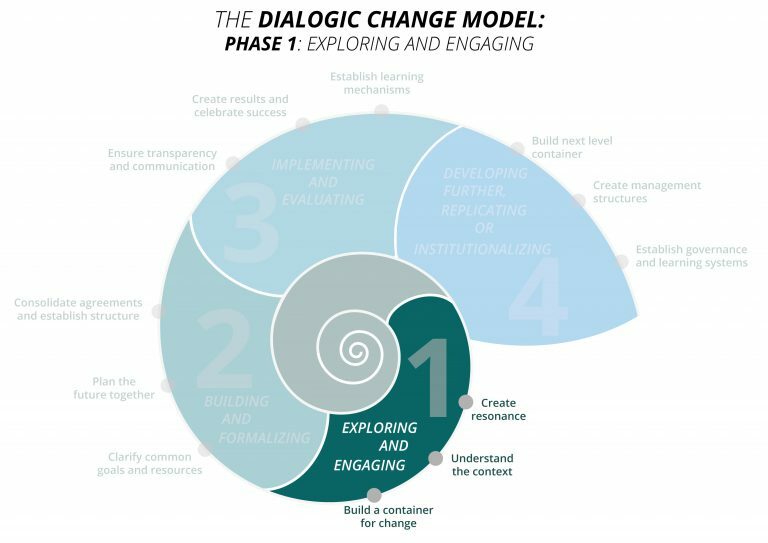 For Stakeholder Dialogues to deliver, it is crucial that stakeholders perceive visible change during the dialogue process, otherwise they might lose interest in the dialogue and in implementing change. It helps – particularly at the beginning – to concentrate on easily achievable results. The goal of a well-structured Phase 3, one could say, is to show that change is possible. Another decisive factor for a successful dialogue and collaboration in implementation is the degree of joint implementation (respectively sufficiently coordinated implementation) and the opportunity for joint review. If the implementation is complex, a secretariat or support team can be appointed to assist in the coordination of implementation and the monitoring of results. During the implementation, there must be opportunities to regularly reflect on the original initiative, as well as on the ongoing process. Sometimes it becomes apparent during the implementation that certain contextual aspects were not adequately considered or that important stakeholders were not included in the process. At this point, it may therefore be helpful to take up the approach used in Phase 1 again to clarify the context fully, extend capacity building, or integrate new stakeholders into the process. Phase 3 can take months or years, and is concluded when the agreed-upon goals have been reached. The complexity of a process often becomes evident during this phase, sometimes in the form of a crisis. Crisis symptoms may include criticism from external parties, stakeholders voicing new, previously unspoken interests, negative press, counter initiatives, endless non-productive discussions, or a group of actors threatening to back out of the dialogue process. Political interests can often hold up an initiative’s development or complicate consensus-building. The more stability and trusting relationships have been created in Phase 1 and 2, the better such phases of instability can be overcome. Once a Stakeholder Dialogue has reached the agreed-upon results, the question remains whether an initiative should stop there, or if it should be further developed. Many Stakeholder Dialogues terminate successfully after Phase 3. If the desired goal has been achieved, success should be adequately celebrated. Participation and contributions of individual stakeholder groups should be acknowledged and appreciated. Nevertheless some Stakeholder Dialogues may want to consolidate their outcomes into sustainable structures. This can mean taking the endeavor to the next level, replicating it at another location, integrating a new issue, or further institutionalizing the dialogue on a more formal level. If taking the initiative or project to the next level seems to be a worthy option, phase 4 needs to concentrate on building appropriate structures without losing sight of the crucial role of people and process. Phase 4 begins by creating the next-level Container by inviting and integrating new participants. Previously uninvolved actors must quickly understand the urgency and importance of an initiative and be able to emotionally connect with the larger goal. This often requires building new structures and developing a governance system that represents the stakeholder groups. Sometimes, it can make sense to set up an institution with the appropriate management structure. 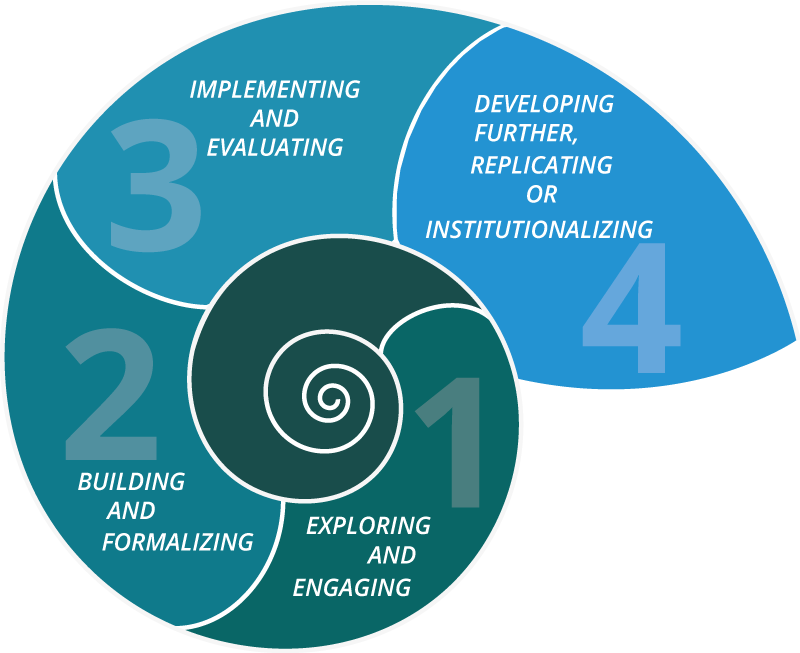 Keep in mind that transparency, stakeholder representation, dialogue, ownership, consensus-building, and outcome orientation also have to be reflected in the institutionalization. The major challenge in phase 4 is keeping the spirit of change alive. The transition from a more loosely structured initiative to an institution is not necessarily an easy process. Replication or institutionalization often requires a professional management structure. Roles change and decision-making structures have to become more efficient. Existing management structures require additional legitimacy and credibility. Therefore, it is recommended that the original core group remains actively involved in phase 4 of a Stakeholder Dialogue, progressively handing over their functions to new actors and transferring the process step by step into its future structure. Registration status: LAST PLACES AVAILABLE!